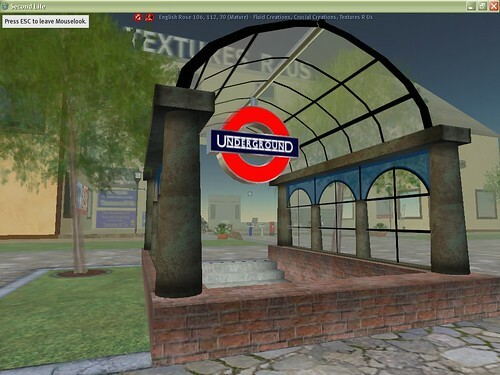 Going Underground reports via Andy Green that there is a London Tube station in Second Life now. She* muses about a SL underground system. Joke not. This would be great. I advise anyone who tries out Second Life to go to bloghud and do a serach for trains etc. There you will find links to SL places where you can sit on a train and get taken on tours of places – the IBM island has a good one. This, as in meatspace, is one of the best ways to be a tourist in my opinion. Sure, it’s great to walk around and discover bits of cities that no guide book can tell you about. But I like going on organised transport to get a feel for where’s where and what’s what in the city. I am also, ultimately, quite lazy. * Great links here too to videos of lego and dancing on tube platforms. ** Just had an initial search for it – can’t find the bloomin thing (please can someone sort out Second Life’s search functions??!!) and Andy’s blog is damn hard to navigate imho!! This entry was posted in London, Second Life, SL, trains, transport, tube, underground. Bookmark the permalink.